Now you can clearly see that the only problem with compliance as the burden of contact precautions increased was with hand hygiene prior to donning of gowns and gloves. Thus, decreased compliance with the contact precautions “bundle” was driven solely by the decrease in hand hygiene prior to patient contact. It has been shown in other studies that hand hygiene is lower prior to contact precautions. And I think there is a very simple reason that this occurs: you can’t get the gloves on until your hands are completely dry. Hand hygiene before and after patient contact is an essential component of standard precautions. 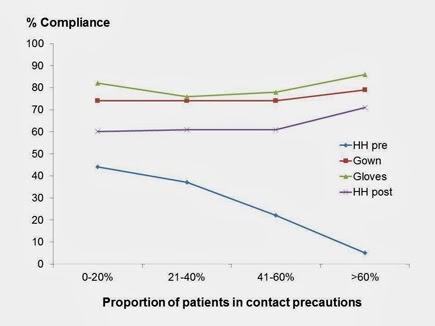 What sets contact precautions apart from standard precautions is the use of gowns and gloves, and the data in this study show no decrease in gown or glove use as the proportion of patients in contact precautions increases. In addition, the overall usage of gowns and gloves was surprisingly high. So my conclusion would be that there is a negative correlation between the burden of contact precautions and hand hygiene prior to patient care. And maybe that’s not so bad.